Long before you reach Big Bend National Park, it is clear that you are amid the wide open spaces of song and legend. You are, in fact, crossing the vast, seemingly empty land that Texans call Big Bend Country, an area about as large as Massachusetts and Connecticut combined. (The bend is the great southward loop that the Rio Grande makes on its long journey from the high Colorado Rockies to the Gulf of Mexico.) The park itself, about the size of Rhode Island, is nestled in a corner of this expanse. You are also in the northern reaches of the great Chihuahuan desert, which extends from New Mexico far southward into old Mexico. About 98 percent of the park is true desert and desert grassland: the finest and most scenic stretch of Chihuahuan desert north of the border. 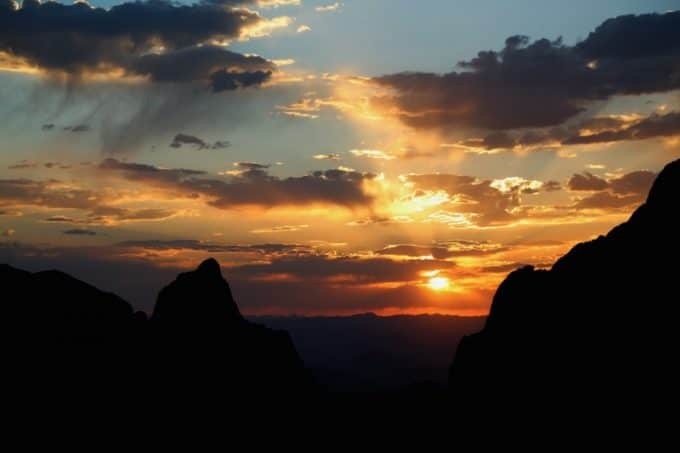 But it is the interplay with the remaining 2 percent–the Chisos Mountains that loom at the heart of the park, and the Rio Grande that is its bulging southern boundary–that gives Big Bend its special character. Together these three environments, river, desert, and mountains, support a world of abundant life that is far greater than the sum of its parts. Thanks largely to the Rio Grande, more kinds of birds–over 400 species by recent count–are found in Big Bend than in any other national park. Ducks and other water birds abound. Mourning doves and white-winged doves nest near the river, as do mockingbirds, summer tanagers, blue grosbeaks, painted buntings, and a host of other songsters. Peregrine falcons patrol the sky along canyon walls, alert for prey. The Chisos Mountains are a moist island in a dry sea–one of the few places on earth where you can rest in the shade of a stately Douglas fir while enjoying the desert scent of creosote bush on the wind. Plant life that once flourished over a large area is now trapped here, often at the extreme edge of its range. An eastern tree, the chinquapin oak, grows in Pulliam Canyon, while a Mexican oak, Coahuila scrub, is found near Laguna Meadow. From the north and west come ponderosa pine in Pine Canyon, Arizona cypress and Douglas fir in Boot Canyon, quaking aspen near Emory Peak, and bigtooth maples in several moist locations. The lechuguilla, on the other hand, is an indicator plant of the Chihuahuan desert–if you see it growing anywhere else it has been introduced–and it thrives and almost all elevations in Big Bend. One of the park’s two striking agave species (the other is the century plant), it blooms and dies after having lived for 10 to 15 years in the form of a rosette of tough, sword-shaped leaves. The needlelike spines on the end of each long blade can be painful to large animals and fatal to small ones; many a grasshopper has been skewered in midhop. The insects are also put there by loggerhead shrikes, birds that habitually impale their prey on handy spikes. On desert slopes and in the grasslands that skirt the mountains, thickets of lechuguilla are often so dense that walking is difficult or impossible for man or beast. In the 1880’s, when great herds of cattle grazed the grasslands between the desert and the Chisos, ranchers considered the lechuguilla a curse. Today’s grassland mammals don’t mind it at all. Pronghorns (often miscalled American antelope) and the more abundant mule deer find good homes here, where the dry world slowly gives way to grasslands punctuated by shrubs and small trees; either animal, when hungry enough, will risk injury to browse on a lechuguilla’s tender young shoots. A grassland animal that does so without risk is the tough-skinned javelina, or collared peccary. The possessor of vicious-looking tusks, a keen nose, poor eyesight, and a musk gland that leaves little doubt of its presence, the pig-like javelina is a formidable creature that weighs in at 50 muscular pounds or so. They are also shy, traveling in bands of about a dozen and feeding in early morning or late evening on a largely vegetarian diet of lechuguilla, prickly pear, stool, and mesquite beans, seasoned with a few insects. Check out the Chisos Mountain Lodge, Big Bend Lodging inside the park!